Evoked potentials are used to measure the electrical activity in certain areas of the brain and spinal cord. Electrical activity is produced by stimulation of specific sensory nerve pathways. These tests are used in combination with other diagnostic tests to assist in the diagnosis of multiple sclerosis (MS) and other disorders. 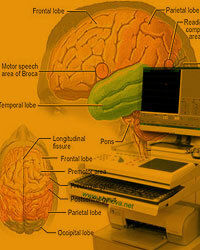 Evoked potentials test and record how quickly and completely the nerve signals reach the brain. These tests are used because they can indicate problems along nerve pathways that are too subtle to show up during a neurologic examination or to be noticed by the person. In MS, signal transmission can slow down and the signal becomes weak. Evoked potentials are used to show abnormalities in the function of nerve pathways that can be caused by MS.
During an evoked potential test, wires are attached to the scalp, neck, and limbs. It usually takes about one to two hours to do each test. The testing is usually harmless and painless. The only discomfort is a slight tingling of the arms and/or legs during stimulation. No needles or injections are involved, and there is no radiation. You may not have to go through all of the tests. While evoked potentials are used to assist with the diagnosis of MS, other conditions can also produce abnormal results. For that reason, a neurologist or a neurophysiologist who has a special training in these tests should interpret the results. Information provided by these tests will be considered along with other findings from a clinical history, neurological exam, MRI, and other clinical or laboratory information when diagnosing a medical condition.